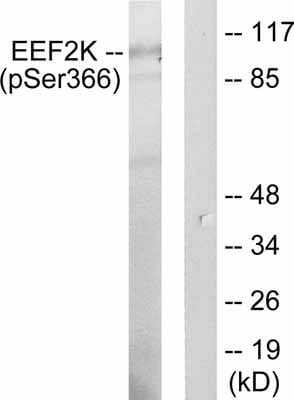 This antibody detects endogenous levels of EEF2K only when phosphorylated at serine 366. A synthesized phosphopeptide derived from human EEF2K around the phosphorylation site of serine 366 (T-L-SP-G-S). Our Abpromise guarantee covers the use of ab51227 in the following tested applications. WB 1/300 - 1/1000. Detects a band of approximately 100 kDa (predicted molecular weight: 95 kDa). Phosphorylates eukaryotic elongation factor-2. Binds calmodulin. Belongs to the protein kinase superfamily. Alpha-type protein kinase family. 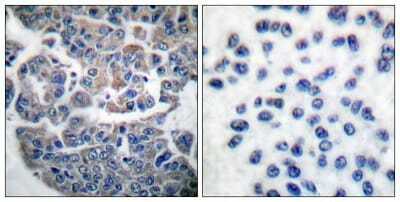 Contains 1 alpha-type protein kinase domain. Lane 1 : Extracts of Hela cells treated with 10% serum for 15mins. Lane 2 : Extracts of Hela cells treated with 10% serum for 15mins and phosphopeptide. ab51227 has not yet been referenced specifically in any publications. Publishing research using ab51227? Please let us know so that we can cite the reference in this datasheet.